Ideal for camping, picnics and with enough style to use around the house. 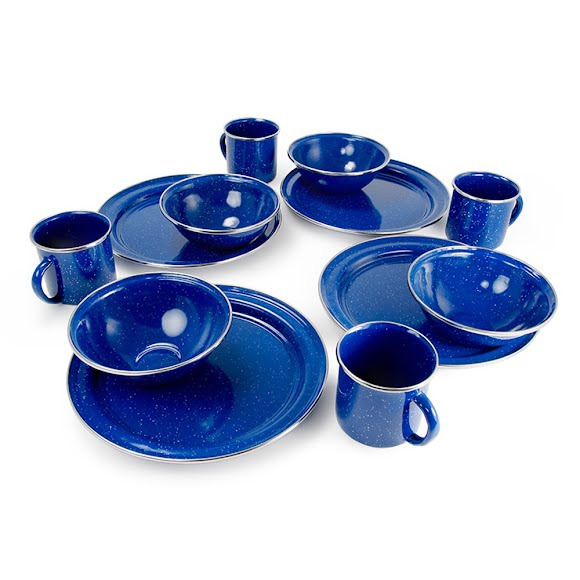 The GSI Outdoors 12 Piece Pioneer Table Set features four place settings, each with cup, plate and bowl in Enamelware for superior durability. Four place enamelware set blends classic style with beautiful red porcelained finish and brilliant stainless steel rim. (4) 12 fluid ounce cups. Heavy glaze; twice kiln-hardened to 1000° F / 537.8° C for superior durability. Enduring steel construction is dishwasher safe and perfectly suited to both indoor and outdoor use. Dimensions (packed) 10.3" x 10.3" x 7.1"